Posted: 2007.02.03(Sat)16:07 Post subject: Advice on driftwood placement? I have found the perfect piece of driftwood for my 29 gallon. Since it will be home to some loaches once it's cycled, I know I can't have it heavily planted. Since they would most likely redecorate my tank with any plants I try, I've decided to go with a nice hardscape instead, but I'm having trouble getting just that perfect placement. It seems heavy on the left side and unbalanced. I was thinking about doing some sloping with the sand substrate to help, but since the loaches will probably be digging around, anything fancy I try to do likely won't last long. Eventually, I'm going to be heavily planting the wood with java moss, and my idea is to try to make it look like a tree. Any plants I do have will be centered right around the wood, so hopefully the loaches won't bother them too much. Should I put a group of rocks on the right side underneath that large branch? Or maybe another, smaller piece of driftwood? 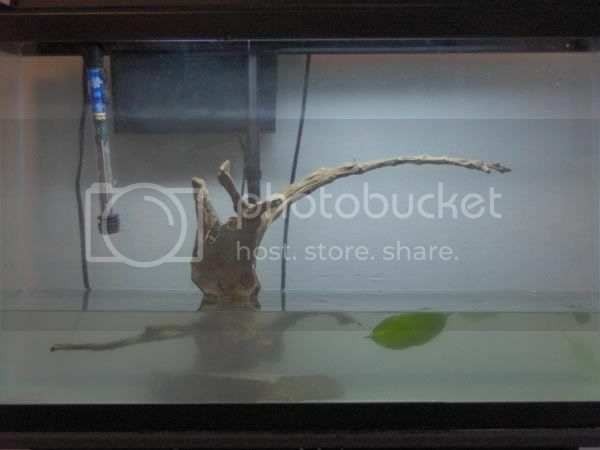 Don't know if this would work or not, but try rotating the base so the branch that is sticking out is pointing more towards the front of the tank. The different angle may be enough to distract the eye from the length of the branch. Hi, I like that piece of wood... I think it would look better if it was sloped. If you can get your hands on it, weeping moss would look amazing with that piece of driftwood. Is weeping moss the same thing as Christmas moss? I had decided against java moss and was going to go with the Christmas stuff, and that weeping moss looks very similar. As for the placement, I ended up putting the driftwood on the other side of the tank and flipping it around, and I'm happy with it now. I'll post some pictures once I get a few plants in there. Not quite the same. Christmas moss tends to grow upwards, while weeping moss droops down, like a weeping willow tree. The catch is that weeping moss is expensive and can be difficult to obtain. I ordered some online and they substituted fives times the amount of java moss instead . I'll look and see if I can find the weeping moss anywhere, because I do like it. But I've already found someone who carries Christmas moss, so if I can't find weeping moss, I'll go with that instead.